L’école a détruit le français, l’école va le faire revivre ("The schools have destroyed French, the schools will make it live again"), James Domengeaux, the founder of the Council for the Development of French in Louisiana (CODOFIL), was often fond of saying. When CODOFIL was created by the state legislature in 1968, the number of native French speakers in Louisiana had seriously diminished in large part because the Louisiana Constitution of 1921 specifically forbade French from being spoken in the schools! From the beginning, CODOFIL’s strategy to revitalize the French language has been based in the public school system. Ours is a unique agency, the only one of its kind in the United States. Born in the midst of the Civil Rights and ethnic revival movements of the late sixties and early seventies, CODOFIL profited from the overall national climate of the time. However, the conditions for success changed in the 1980s: Mr. Domengeaux passed away, the notion that English should be declared our official national language began to grow, and a drop in oil prices diminished the state budget. CODOFIL had to reinvent itself. Since its creation, CODOFIL's role has evolved from that of a source of ethnic pride for the once denigrated French-speakers of Louisiana, to a simple provider of Foreign Associate Teachers (FAT) of French to Louisiana schools, and, most recently, as an advocate for the teaching and learning of French, especially through immersion education. In its newest role, CODOFIL has encountered many obstacles that programs in other parts of the country are just now facing. Located in the city of Lafayette, French Louisiana’s unofficial capital, CODOFIL is the only state agency with headquarters outside the offical state capital of Baton Rouge. With just one part-time and five full-time employees, CODOFIL must "do [...] any and all things necessary for the promotion and preservation of the French language." Given its vast mandate and limited resources (the annual budget is around $300,000), we have chosen to concentrate our efforts in three areas: teacher recruitment and retention, public relations and curriculum development. Finding personnel who are both native or near-native speakers of the target language and certified teachers is perhaps the first and greatest challenge our schools face. CODOFIL has responded by signing a series of accords with the governments of several French-speaking countries, including France, the French Community of Belgium, Haiti and the Canadian provinces of Québec and New Brunswick. We are currently negotiating with Tunisia and are seeking a partner in sub-Saharan Africa. These agreements allow us to define a recruiting process that weeds out the "tourists," as we call those who are only seeking a means to a paid vacation in the US. We are thus able to select from a pool of highly motivated, qualified candidates. As a result, we currently have 229 FATs from twelve different countries working in twenty-nine school districts (out of sixty-six in Louisiana). For French Immersion, we have approximately 2,200 students in thirty different schools in ten districts. As a participant in the State Department’s Exchange Visitor Program, CODOFIL has the right to issue formula DS-2019 (formerly IAP-66) to the certified teachers we recruit. Once accorded by the US embassy in their home country, the teachers can stay three years on a J-1, non-immigrant visa. Those who wish to stay beyond the three, and who are asked to do so by the school district, can be sponsored for an H-1B visa. As one might suspect, since September 11, 2001, the administration of the program has undergone a few changes, most notably the requirement to enter each teacher directly into an INS database over the internet. While adding to the workload, these changes will, over the long run, help us ensure the integrity of the program. Because our candidates are certified teachers in their home countries, the Board of Elementary and Secondary Education (BESE) in Louisiana grants them temporary certification. If they perform their duties satisfactorily for two years, they may apply for full certification as a French teacher with the State Department of Education. While the visas are good for three years, the contracts with CODOFIL must be renewed annually. That way, it is easier for us to remove teachers who are not working out, at which time their visas are revoked. CODOFIL matches incoming FATs with individuals, often former CODOFIL teachers who have decided to become permanent US residents or citizens, who are able to facilitate their transition to American life. CODOFIL also offers a training to prepare them for the differences they will find both in and out of the classroom. Because each school district has a different pay scale for its regular teachers and since the FATs do not decide which district they will be named to, the BESE has established a separate pay scale which is the same for all CODOFIL teachers wherever they are assigned. There is even a built-in financial incentive for the school district to take FATs. School districts are allocated a certain amount of money over and above their normal allocation from state funds earmarked for teacher salaries. CODOFIL also acts as the teacher’s advocate in case there are any disputes with payroll. We are almost constantly reminding the individual school districts of how they must treat the FATs differently for tax purposes. We must also make them aware of the differences between nationalities because of specific tax treaties. Traditionally, in times of budget crunches, second language, art and music programs have been the first areas of the curriculum to be cut. CODOFIL has mobilized grass-roots organizations in favor of retaining and expanding French programs throughout the state. We work closely with school principals so that they can be as well informed about immersion education as possible. And, as a state agency, CODOFIL has the advantage of ready, although not always easy, access to other state agencies involved in education. 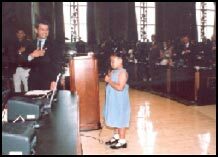 Lobbying efforts have ranged from speaking on the phone individually with legislators and school board members to having immersion students recite the Pledge of Allegiance in French on the floor of the State legislature (see photo). Parent support groups are an essential partner in lobbying school boards. In Louisiana, each parish (school district) with an immersion program also has a parent support group, always with a French name—Les Amis de l’Immersion or Le Réveil du Français, for example. Whenever a board is about to consider something that may have an adverse effect on the immersion program, a few phone calls will have fifty or more parents at the next meeting. Parents also support the schools financially providing funds to buy needed supplies or to pay for the added photocopies that immersion programs need and that school districts are not always willing to pay for. This, along with the above mentioned salary incentives, helps control the overall cost of an immersion program to the district. Across the country, accountability programs are pushing some districts to eliminate anything that does not appear to contribute directly to student success on standardized tests. One way to counter this is to disseminate test results for immersion students as their scores regularly speak to the strengths of immersion education. Dissemination is accomplished in a variety of ways: handouts at parent meetings, letters to the editor, posting the results on our website, and even appearances on local television and radio programs. However, such publicity can be a double-edged sword since non-immersion schools often assume that immersion schools operate under special circumstances which account for the high test scores. Thus, public education becomes vital and the principal in an immersion school takes on an important role. She needs to stress that immersion students are not hand-picked among the best and brightest, but become some of the best and brightest because of immersion education. She can also remind stakeholders that while immersion students may do well on the tests, attention should also be paid to whether the students’ oral and written skills in the target language are acceptable or not. Having a native French language and heritage in Louisiana creates a unique set of circumstances vis-à-vis course materials. Not only must we adapt English curriculum materials, we often have to make slight changes to French language materials in order to reflect the reality of La Louisiane. Like all immersion programs in the US, we must adhere to the curriculum adopted by the state and the local school districts. The textbooks conforming to the curriculum are, of course, in English. At first, the only solution, while not the most satisfactory, has been to translate the English text, with makeshift "textbooks" being slapped together with a photocopying machine and a stapler. Sometimes, we can procure textbooks, mainly from Québec, that may be adapted to the curriculum, but this solution has been less than satisfactory. Canadian texts may be acceptable for science and math, for example, but there are no US or Louisiana history textbooks available in French. Our greatest success has been in the creation of social studies materials geared to Louisiana’s particular French vocabulary and culture. Committees of dedicated immersion teachers and supervisors have worked long hours after school, on weekends, and over the summer developing these materials. Luckily, we have received federal grants over the last few years to pay for the development of these materials which are then shared among the different districts. One project has been the translation of the state’s regular Standards and Benchmarks into French. We have added certain points specific to French, such as when children can be expected to master the difference between masculine and feminine nouns. Eventually, we want to have these standards and benchmarks included in Bulletin 741, the "Bible" for education in Louisiana. We are presently working with BESE to have certain standards put in place, such as the number of contact minutes per school day in the target language that are necessary for a program to be considered immersion. Given Louisiana’s unique French heritage, it may not be politically feasible for other states to create an agency like CODOFIL. However, if educational leaders are serious about ensuring the success of immersion education in their jurisdictions, they should give thought to starting a similar organization. It is undeniable that CODOFIL has been able to tackle many of the problems that immersion schools have with teacher recruitment and retention, public relations, and curriculum development.